Sony's 2019 TV range has finally arrived – well, some of it. While most of the TV market has already shown its hand for the year, Sony is only now confirming pricing and release dates for many of its new TVs, but what we have seen is still impressive. Sony made its usual round of televisual announcements at CES 2019, the massive international tech expo that heralds the start to the tech industry's calendar year, and it's more of what we wanted to see. The headline product is the new massive 8K Master Series Z9G / ZG9 model, in 85- and 98-inch options. For anyone (or everyone) who can't fit that into their homes, there are plenty of new 4K smart TVs, including additions to the Master and Bravia OLED series will appear, as well as a few mid-range sets too. While it didn't get much fanfare at the expo itself, we'll also be seeing an upgrade to last year's entry-level Full HD HDR TV, the WF66, for more modest budgets. There's certainly be more surprises and upgrades in the coming months, but for now here are all the Sony TVs we expect to see in 2019 – all kept in one place so you can know your Bravia from your elbow. And don't worry, we'll update this list going forward, so do check back in every few weeks to see all the latest announcements. It's not always about the panel quality when it comes to buying a new TV. The processor inside, telling the TV what to do is equally – if not more – important. The A9G / AG9 OLED is still carrying its predecessor's X1 Extreme – though the organic OLED display should mean rich visuals regardless. The X1 Extreme is now finally entrenched among Sony's mid-range sets, bringing sharper 4K to the X9500G / XG95 and hopefully more besides. On the audio front, Sony is learning from the Acoustic Surface Audio+ technology it showed off in last year's OLED, with strategically placed drivers across the chassis of the set to deliver more powerful yet compact sound – amid growing demand for in-built audio that doesn't need an external hi-fi system to do it justice. The more high-end models will 2019 will also use Sony's 'Sound-from-Picture' technology to accurately emit audio from where its source is located onscreen – meaning you when someone speaks, it actually comes from their mouth. Last year's Sony A9F OLED (2018) made much of its Acoustic Surface Audio+ technology, which uses various drivers to emit sound across the surface of the screen. Sony doesn't particularly like to release specs on the brightness of its TVs, but as usual we expect the OLED offering to lag behind on this front: the organic LED film used in the panel is self-emitting, so doesn't have the benefit of a big backlight to really crank up the lumens. The Z9G, however, is bringing back the popular Backlight Master Drive technology that defined Sony's Z Series sets back in 2016 – allowing for hugely precise use of white LEDs, to use brightness where it's needed, with sharpened contrast and minimal bleeding into surrounding dimming zones. It makes for a thicker and heavier set, but if you're buying an 85 or 98-inch set, space probably isn't a problem. All of Sony's 4K sets share the Android TV platform and YouView. That means Google technically owns the smart platform, and this has led to some unsavory ad-pushing being trialled on Sony TVs, but we're hoping this either remains a small annoyance or doesn't last past the trial. While Dolby Vision was limited to the X900F and Master Series sets last year, this is thankfully trickling down, and will come to all four 4K sets listed below so far – and it seems Sony will be pursuing Dolby's video format over the rival HDR10+ format. Google Assistant meanwhile has been rolling out to all of Sony's 4K HDR TVs in the UK and Europe (albeit a year after the US) allowing hands-free voice control. Sony Z9G 8K (available in 85, 98 inches): An 8K wonder powered by Sony's X1 Ultimate processor, with a resurrected Backlight Master Drive from Sony's 2016 Z Series TVs promising enhanced contrast and precision controlled brightness. Available in the second half of 2019, with a monstrously large 98-inch option for those who can house it, and a dedicated viewing mode for watching Netflix. Intrigued? If the $70,000 price tag doesn't puts you off – or even if it does – read more in our hands on Sony Bravia Master Series Z9G 8K HDR TV review. Sony A9G 4K (available in 55, 65, 77 inches): Arriving in September 2019, this second-tier Master Series set uses the X1 Ultimate processor to power some serious 4K visuals – as well as the same Netflix Calibrated Mode as the Z9G. With an OLED panel, you'll also be getting some vivid color contrast and deep blacks, even if high-end LED tech is starting to give it a run for its money. Available May 2019 in the US. 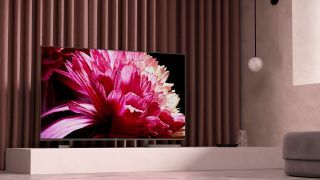 Sony A8G OLED (available in 55, 65 inches): Featuring the same X1 Extreme processor and Acoustic Surface Audio as last year's A1 OLED, the A8G / AG8 sticks to 55 and 65-inch models, leaving the 77-inch size to its Master Series OLED counterpart. In a snazzy design choice, you can also adjust the height of the TV stand to make room for a soundbar. Sony X9500G (available in 55, 65, 75, 85 inches): Now onto the 4K LCDs... This model still packs in the Dolby Vision and Dolby Atmos support of its more expensive siblings, and the more advanced X1 Ultimate processor for enhanced upscaling and image processing. You get the welcome choice of four distinct size options, including a massive 85-inch display. Starting at $1,399 / £1,899 (around AU$1,972) for the 55-inch model. Sony X9000G 4K HDR TV (available in 49 inches): A mid-priced, X1 Extreme powered version of the above – and coming in at a more size-friendly 49 inches. Currently only announced for UK. Sony X8500G 4K HDR TV (available in 55, 65, 75, 85 inches): A step down again, the X8500G / XG85 goes back to a simpler X1 processor (no Extreme or Ultimate upgrade) and more basic backlighting and dimming zones. Last year's model came with edge LED lighting, which simply couldn't meet the demands of today's HDR pictures – but we'll reserve our judgement on this one until it's come in to review. Starting at $1,099 / £1,399 (around AU$1,549). Sony XG83 4K HDR TV (available in 43, 49 inches): Like last year’s model, the XG83 only offers the most basic X1 Processor and 4K X-Reality Pro Upscaler. You'll still get 4K HDR pictures. but they probably won't look nearly as good as they will on the X9000F and above. That said, you can display HDR10 and Hybrid Log Gamma - and the XG83 sports a stylish aluminium body. Currently only announced for UK, starting at £999. Sony XG81 4K HDR TV (available in 43, 49, 55, 65 inches): Down to the X-Reality processor, meaning you won’t get as advanced picture processing as above, but you do get a far wider range of model sizes with the XG81 - with only a ‘brushed aluminium look’ though. Currently only announced for UK. Sony XG80 4K HDR TV (available in 43, 49, 55, 65, 75 inches): Comparable to the XG81, but more basic dimming zones, and a 75-inch model to make up for it. Announced for UK / US. Sony XG70 4K HDR TV (available in 43, 49, 55, 65 inches): This UK-exclusive set is the runt of the HDR litter: a 4K-resolution display with HDR10 and not much else. You’ll get sharper images than the Full HD sets below, though. Available in silver or black. Currently only announced for UK. Sony WG6/W66G (available in 43- and 50-inch sizes): If you've got a hankering for an HDR-capable TV but aren't too keen on 4K, Sony's entry-level W66G (WG6 in the UK) is exactly what you've been looking for. Perfect for Full HD HDR gaming, or just squeezing some extra-rich colors and depth out of 1080p resolution TV, this 2019 model is a smart compromise between cost and performance.